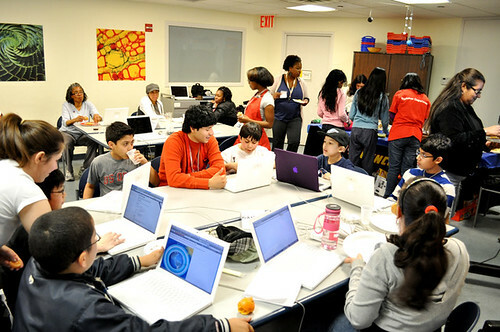 On April 22, 2011, tweens, teens and families celebrated Earth Day at the New York Hall of Science (NYSCI) My Carbon Footprint 3D Design Hack Jam. If you have any hesitation about hitching a ride on the "design jam" bandwagon, then you just need to witness the array of projects and hear the experiences that were had by participants at this event. The event brought together youth from two NYSCI Schools Out Innovation camps that were running during the New York City spring break. Both camps were made up of middle school age youth who had been exploring in detail themes of the Jam such as 3D design, climate change and digital tools. While the camp was a structured informal learning experience, the Hack Jam allowed the youth to showcase their expertise in a much more free flowing and interest driven environment. In addition to the NYSCI campers, there were also NYSCI Explainers and Explainer Interns who work at NYSCI and are involved in both in leading the camps and participating in digital design projects with NYSCI Education staff. These Explainers ranged in age from 15-20. The Jam was orchestrated by the staff at NYSCI and the New Youth City Learning Network, and made possible by the Mozilla Foundation, The MacArthur Foundation, The National Science Foundation and the Deutsche Bank Climate Change Advisors. However what made it successful is that the teenage NYSCI Explainers took ownership in the event and acted as peer mentors for all of the activities taking place. NYSCI's Virtual Hall of Science is a 3D world built in the Active Worlds software similar to Second Life. 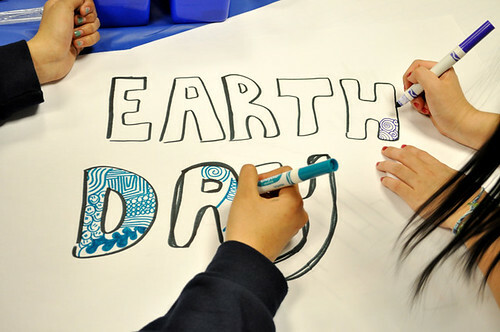 Teens had the chance to work with each other to develop interactive exhibits, scavenger hunts and virtual stories all building around the theme of Earth Day. In order to do this, teens used various technologies including Active Worlds, digital imaging software and Google Sketchup. The VHOS team placed the beginnings of two exhibits in the Deutsche Bank Climate Change Advisors "wing" of VHOS, a map of the United States and blank gallery walls. Hack Jam participants then researched various temperatures through geological time and placed pinned them to the interactive map. Contests were held to see who could place the most data points on the VHOS map, with 15 being the winner! The blank walls were where digital photos were currated and hung to demonstrate what youth were understanding about their carbon footprint both inside and outside the walls of NYSCI. Funding for the Virtual Hall of Science project is provided by the National Science Foundation. 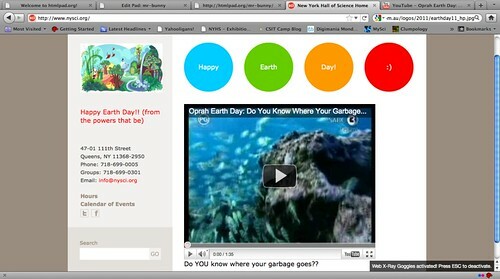 View more presentations from nycln. and some, who really got into the project geeked out and made websites like this and shared it in the VHOS exhibition space. "Jessica showed us how to use Hackasaurus and delete and change elements of a webpage (locally only). The Hackasaurus Firefox add-on is really cool. When we started out, I didn't know how it worked and actually "went backwards" and made my own website before I learned how to hack an existing one." blog post from Jam participant, Ishum. Digital Imaging- Earth Day is a time to embrace the outdoors, so many teens left the Jam and took photos and videos outside while looking for examples of our carbon footprint. They then creatively integrated the best images into a photo gallery in VHOS, or embedded into participant created websites. Paper Prototyping- Some participants wanted to sketch out concepts before taking their work online, others wanted to draw assets to be incorporated into VHOS after they were photographed, and some teens just wanted to use their hands and draw. This station accommodate all of the designers who were interested in mixed media in some form. The event was intentionally designed to be messy, so that participants could float around from station to station to play, explore and create. The room was laid out with tables containing digital and analog materials. A LCD screen and two projectors were positioned so participants could share their work and see what other teens were doing at any given point during the event. At many times during the Jam the room was a hot wonderful mess of wires, laptops, butcher paper, crayons, cameras and snacks! The beginning of the event was scaffolded so that teens could move around and experiment with all of the tools available. Many of the youth took this opportunity to explore while others had a clear focus on what interested them. Interestingly within a few hours teens were in control and had both sampled at least a few of the activities while also getting down to some serious tinkering! An unantipated joy was the inclusion of family members of the youth participants. 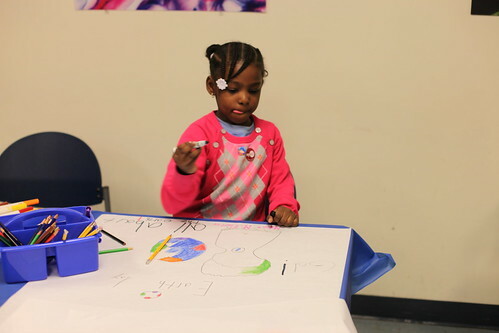 We had teachers who had come to visit their students in the NYSCI Innovation Camps, parents excited to join the fun and many siblings (ages 2-12!) who saddled up to their brothers, sisters and cousins to learn about and participate in all the making. A head count of participants of all ages topped 75 people by the Jam's end at 6 PM. The event was successful because teens had a multitude of tools and mediums to explore their interests in science, the environment and digital media and they embraced the casual atmosphere of the Jam as a moment to experiment and share. The Jam incorporated the programmatic work that NYSCI and the NYCLN are doing, however both organizations allowed their work to be remixed in the event so that teens and staff worked on different projects and could collaborate in a social setting. The result was that over 50 youth played in different modalities, self-identified as experts in a variety of thematic as well as technical areas, and established working relationships with peers. What will you be doing for your Jam?